This actress keeps her dermatologist on speed dial too. As a light skinned, be-freckled woman with a history of pre-melanoma, I have been sternly instructed to keep my dermatologist on speed dial. Every six months I dutifully return to his office for inspection – nervously eyeing the biopsy tray as I sweat through my paper gown, legs dangling from a vinyl exam table. 1. Dryer sheets. According to my dermatologist, dryer sheets contain “a horrible chemical that no one can pronounce” that becomes “slathered all over your clothing” during the drying process. Although I was fond of the fresh scent and soft texture of my gym clothes, he assured me that heat and moisture was the best way to re-activate the irritating chemicals on delicate skin, virtually guaranteeing a contact dermatitis of the nether regions. So if you’ve been experiencing any unpleasant post-work out skin “issues” – consider dryer sheets as a potential cause. 2. Antibacterial ointments. Personally, I find that over-the-counter antibacterial ointments do a great job of preventing razor bumps. However, my dermatologist says that repeated or excessive use of these products can lead to allergies and colonization with antibiotic-resistant organisms. So… unless you want to be giving MRSA a “come-hither stare,” you might want to opt out of the Neosporin. 3. Battery-operated exfoliating brushes. I’ve seen so many ads for Clarisonic-type products that I figured they would be a reasonable choice for facial exfoliation needs. In fact, this topic may be somewhat controversial since I know other doctors who recommend these products. However, my dermatologist says that they are overkill and might do more harm than good to delicate facial skin, especially if you use any products that have an exfoliating acid included in their ingredient list, or if you use scrub creams. In other words, if you wash your face regularly, you probably don’t need to use additional aggressive cleaning measures. 4. Skin-lightening cream (hydroquinone) can reduce the appearance of sun damage. Hydroquinone is the active ingredient in most skin-lightening creams. It acts to down-regulate melanin production in melanocytes, but can be reversed fairly easily by UV exposure (i.e. sunlight up-regulates melanin production). So even if you’re already pale-skinned, hydroquinone products can even out skin tones and sun spots – but only if you simultaneously commit to aggressive avoidance of UV exposure. Formaldehyde And Permanent Press Clothing: What’s The Harm? Some of you may find this surprising, but I don’t mind ironing. Unlike giving a lecture, writing a column or appearing on TV or radio, you get immediate gratification. You see the results of your efforts. Wrinkles that were there before are gone. I suspect, however, that not everyone shares my enthusiasm for this task. The textile industry realizes this as well and has responded by producing a variety of “durable press” fabrics that can withstand wrinkles. But withstanding allegations of toxicity is more of a challenge. In this case the hullabaloo is about formaldehyde, the chemical used to fashion garments that can come straight out of the washing machine and sidestep the ironing board. Wrinkling is a direct consequence of the molecular structure of cellulose, the main component of cotton. This polymer is made up of repeating units of glucose, but the important feature of cellulose, as far as wrinkling is concerned, is that adjacent molecules can form weak associations with each other. These “hydrogen bonds” are responsible for maintaining the shape of the fabric. But when cotton is moistened, water molecules insert themselves between the long chains of cellulose, cleaving the hydrogen bonds. The cellulose molecules can now move relative to each other, and as the fabric dries and the water molecules evaporate, the hydrogen bonds reform holding the fabric in its new shape, which is usually wrinkled. Another factor in wrinkling is the thickness of the cotton fibers. Fabric woven with very fine cotton thread will crease less than fabric made with more coarse thread. Heat can also disrupt hydrogen bonds, which explains how ironing works. The weight of the iron flattens the fabric and the novel shape is then retained as the material cools. 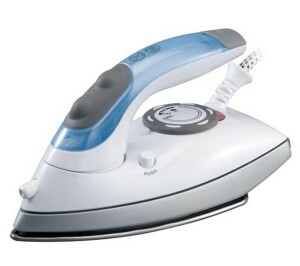 Ironing with steam is especially effective because the added water molecules serve as an internal lubricant, breaking hydrogen bonds and allowing cellulose molecules to slide past each other. As heat is applied, the water evaporates, hydrogen bonds reform, and we have a smoothened fabric. At least until it gets moist from perspiration. The earliest attempts to reduce wrinkling made use of starch, possibly as early as 800 BC. Like cellulose, starch is made of repeating units of glucose, and the two substances have an affinity for each other. A starch solution readily penetrates into cotton fibers and when the fabric dries the molecules of starch bind to each other forming a hard network, stiffening the fiber. An analogy would be a canvas water hose that can be easily folded when empty, but becomes stiff when filled with water. The problem with starch, though, is that it comes out in the wash and has to be applied each time. The early part of the twentieth century saw the introduction of a number of synthetic resins such as urea-formaldehyde which presented textile manufacturers with an opportunity to “stuff” fibers with a substance that would not wash out as readily as starch. It worked reasonably well, but when the chemical structure of cellulose became clarified in the late twenties, chemists came up with another idea. Given that wrinkling is caused by the movement of the cellulose molecules relative to each other, why not find a way to form bonds between cellulose molecules that are not as easily disrupted by moisture as hydrogen bonds? Formaldehyde was just the molecule for this task. It readily reacts with the hydroxyl groups on cellulose to form cross-links, much like the rungs of a ladder. The idea is to form the fabric into the desired shape and then treat it with formaldehyde to retain that shape. Manchester textile manufacturer Tootal Broadhurst Lee was the first company to use this process commercially back in the 1930s, producing the world’s first “wrinkle-free” garment, the “Tootal” tie. But it wasn’t long before a wrinkle appeared in the novel technology. The garments released the irritating odour of formaldehyde. Not only was this smell unpleasant, but formaldehyde was also responsible for the allergic contact dermatitis reactions that emerged with the use of the durable press fabrics. Later there would be increased concern about formaldehyde treatments as studies began to show that at least in animals the chemical was a carcinogen. By the 1990s significant improvement had been made in technology to reduce formaldehyde release from treated fabrics. During manufacture the fabric was subjected to huge rollers that squeezed out excess formaldehyde followed by heat treatment in an oven to cure the formaldehyde and prevent it from being released. Another method that requires less formaldehyde, known as “vapour phase technology,” involves hanging moistened clothing in an airtight chamber and treating it with a gaseous mixture of formaldehyde and sulphur dioxide to form the required cross-links. A number of other cross-linking agents have also been introduced, with the most widely used ones being dimethyloldihydroxyethyleneurea (DMDHEU) and ethylene-urea/melamine-formaldehyde (EUMF). While effective at producing wrinkle-free fabrics, they, like formaldehyde, can still cause allergic reactions. Exposure to permanent-press fabrics should always be considered as a possible cause of dermatitis that has no obvious trigger. Although the amount of formaldehyde released from permanent press fabrics is unlikely to affect health except for rare cases of allergic dermatitis, manufacturers have made determined efforts to reduce formaldehyde exposure. The textile industry uses a “Sealed Jar Test” to measure the amount of formaldehyde released from one gram of fabric under controlled conditions. Since the early days of durable press, the amount released has been decreased by a factor of ten. Cross-linking agents that do not release formaldehyde at all, such as dimethylurea glyoxal (DMUG), have also been developed but they cost more and do not perform quite as well. The advent in the 1960s of polyester fabrics with a greatly reduced tendency to wrinkle took some of the pressure off producing wrinkle-resistant cotton fabrics. But since not everyone likes the feel of polyester, even when blended with cotton, the prospect of producing a truly permanent-press cotton fabric still looms in front of manufacturers’ eyes. They’re getting there though. Recently I bought some shirts that barely need the touch of an iron. And as far as formaldehyde exposure from such fabrics goes, well, I think there are far bigger wrinkles in the fabric of life to worry about. Joe Schwarcz, Ph.D., is the Director of McGill University’s Office for Science and Society and teaches a variety of courses in McGill’s Chemistry Department and in the Faculty of Medicine with emphasis on health issues, including aspects of “Alternative Medicine”. He is well known for his informative and entertaining public lectures on topics ranging from the chemistry of love to the science of aging. Using stage magic to make scientific points is one of his specialties. Many people assume that look-alike over-the-counter (OTC) medicines contain the same active ingredients as the more expensive brand name products. But that’s not always the case. Take lip medicines for example – many of their labels suggest that they treat cold sores (caused by the herpes simplex virus), but only one active ingredient has been proven to work. Docosanol is the active ingredient in Abreva, and has been approved by the FDA to shorten the duration as well as prevent the outbreak of cold sores (an estimated 20-40% of Americans are afflicted by cold sores). In a recent survey (sponsored by Abreva), 66% of respondents said they believed that “look-alike” medications contained the same active ingredients as the brands that they were copying, and 93% said they purchased look-alikes solely because they were less expensive. Several “look-alike” cold sore treatments tout healing claims, but contain the ingredient Benzalkonium Chloride instead of docosonal. The FDA recently issued a warning letter to a marketer and distributor of a product containing benzalkonium chloride that is making the claim on its product’s label that it heals cold sores. The FDA found that the active ingredient, benzalkonium chloride, is not indicated as a cold sore treatment and may not make cold sore healing claims because there is no scientific evidence to support claims that it heals cold sores. Evidence suggests that Abreva shortens the duration of cold sores by about 18 hours, and may slightly reduce the risk of outbreak if the medicine is used at the first sign of pain or tingling. Whether that’s worth the price of the treatment is up to the consumer, but choosing a cheaper product with a different active ingredient is likely to be a waste of money. The Abreva case serves as a reminder to check the active ingredients in your OTC medicines before purchasing what seems to be a cheaper, equivalent medicine. While generics are often a smart way to save money on effective medicines, look-alike medicines can sometimes be hiding fake cures in a convincing little package. Let the buyer beware! I’m a dermatologist’s dream – a fair-skinned, freckly person with lots of small moles. The perfect candidate for a lifetime of 6-month skin checks! Luckily for me, none of my moles have ever been cancerous. To be honest (please look the other way, dermatologist friends) I have sometimes put off skin checks for fear of being invited to undergo yet another biopsy. I’ve had about 9 procedures so far, and I have the scars to prove it. But this time around, I found a product that really reduced my healing time and scarring. I’m so excited about the results that I don’t care if I need a total-body shave biopsy next year. Bring it on! No one will be able to tell. It is a little surprising that hydrocolloid gel technology hasn’t been on the consumer market for all that long (I wasn’t able to figure out when this product was launched in retail stores but it seems to me that I’ve only seen it around for the last few years or so). Hydrocolloid dressings are a staple in wound healing in the hospital setting, and I’ve seen marvelous results with pressure ulcer repair in the hands of experienced wound care nurses. The gel essentially creates a moist scaffold for skin cells to fill in defects and divots. The gel absorbs moisture from the skin and wound “oozing” while creating a sterile barrier against dirt and germs. The scab-less healing creates minimal scar tissue and the bandage is hypo-allergenic and incredibly flexible. 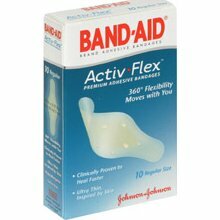 The product I used is called ActivFlex premium adhesive bandages (a Johnson & Johnson Band-Aid brand). I’ve seen generic knock-offs on store shelves but haven’t tried them. All I can say is that the experience has been terrific, and it’s such a relief to know that I don’t need to worry about scars from small cuts, burns, or mole biopsies any more. This is a fantastic invention – and I’d love to hear from others (be they dermatologists, plastic surgeons, or regular users of the product) to find out if they’ve had the same luck! No need to fear skin checks anymore, my fair-skinned friends. You can recover nicely from procedures with a little hydrocolloid help from your local grocery store or pharmacy. Could Your Skinny Jeans Be To Blame For A Rash On Your Legs? If your legs are red, bumpy, and irritated, don’t blame your soap or body lotion. It may be your skinny jeans. Those popular body-huggers may look hot, but they could be causing some very uncool things on your skin.